Upper back and neck tension are complaints that are becoming more prevalent in physical therapy offices. With the increasing use of computers, desk jobs and time sitting in traffic, it’s hard to avoid these aches and pains regardless of how active you are. Here’s why–most of our daily activities are done in front of us while seated. How many times a day do you spend driving, writing, typing or eating? Over time, gravity takes over and the shoulders begin to round forward, the chest becomes constricted, the head juts out, and the upper back becomes stretched out or rounded. The result of this posture is tight pectorals, shortened neck and weak upper back muscles. Consequently, smaller muscles that were not originally designed to be ‘postural muscles’ have to kick in and work hard to keep our bodies upright. In addition, certain sports including cycling and running can exacerbate the problem. Pain in the upper back and neck is often just a sign that your muscles are tired of doing a job they weren’t meant for. The solution is to fix the problem, not the symptoms. In order to combat chronic tension in these areas, you first need to work on stretching the tight structures that prevent you from sitting or standing with ideal alignment. If you strengthen the upper back without stretching the front of the chest, you will just keep falling back into the same faulty posture. Once you open up the chest and stretch out the back of the neck, then it’ll be time to work on strengthening the upper back. Yoga is a wonderful way to accomplish both stretching and strengthening in a gentle and effective way. Here are a few suggested poses that you can work on at home or at the office. Deep breathing is the first step to relieving neck tension. When we breathe in a shallow manner, the muscles of the neck (instead of the diaphragm) contract. To begin to breathe deeply using the diaphragm, sit upright at the edge of a chair with your feet planted firmly on the floor. Make sure the knees are lower than your hips. Place your hands on your belly and close your eyes. As you inhale, feel your belly rise into your hands and as you exhale, feel it fall. Notice any tension in the neck and relax your neck muscles as you direct the breath into the belly. As you breathe, bring your awareness into the front of the chest and the collar bones. Broaden your collar bones so the front of the chest lifts up. Drop your shoulder blades away from the ears and lift the crown of the head towards the sky. Continue to breathe this way for 10 deep breaths. Try to do this every hour by setting an alarm as a reminder to stop, breathe and notice your posture. Stand along side a wall and place your right hand up on the wall to 12 o’clock. Slowly move your hand from 12 to 1, 2 and finally to the position at 3 o’clock. Take your left hand and place it on the right rib cage. Take a deep inhalation and as you exhale, pull the rib cage forward without moving the right arm. You should feel a stretch in front of the right shoulder or down the right arm. Hold for six deep breaths. To intensify the stretch, move closer to the wall. Repeat on the other side. If there is any tingling in the arm, move away from the wall until it resolves or discontinue the exercise. 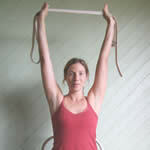 Using a yoga strap or belt, take your arms overhead, shoulder-distance apart. Make sure the palms face away from each other. If you cannot straighten your elbows in this position, take the arms wider on the belt. Drop the chin into the chest in order to relax the neck muscles and pull the strap apart. Hold for six deep breaths and repeat two times. Stand facing a wall with your hands at waist-height. Walk your feet back into a table top position with your feet directly underneath your hips. Lift the sitting bones towards the sky as you press the hands into the wall. Feel as if your heart is melting towards the floor. If you feel a great deal of stretching in the hamstrings, keep the knees slightly bent. Hold for six deep breaths, focusing on opening the chest and lengthening the spine. As with all things, consistency is the key and the more regularly you practice these exercises, the better off you’ll be. Ideally, you should get up every hour to stretch even for a minute or two. Remember–we are fighting a battle against gravity. With regular practice and the right guidance you can stand tall, proud and pain-free for life. It is possible that your pain is coming from a different condition and therefore is important to consult with a doctor or physical therapist prior to beginning any exercise program.